Aaj Ki Awaz is a 1984 Indian Bollywood film released on Sep 07, 1984. The film is directed by B.R.Chopra, produced by Ravi Chopra. Prabhat Varma, a poet and professor of Sanskrit, came to Bombay and found himself in the vortex of violence and lawlessness soon on arri- val. He realised that as the law was infirm, it could not punish the unsocial elements in the underworld. He became an avenging angel to destroy those who ondulged in wanton lawlessness, perpetrated terrori- sm to kill peaca loving citizens, and surrendered himself to the poli- ce to take his trial. The court had no evidence to convict him and had to let him off. Check out this page for more updates on Aaj Ki Awaz. This page provides latest and updated information about Aaj Ki Awaz (1984) movie which released on Sep 07, 1984. 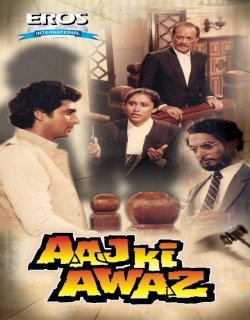 Aaj Ki Awaz (1984) is directed by , produced by , starring .We have also provided 0 trailers and videos, 1 photos, 0 user reviews, and 0 critic reviews.You can review, like, dislike this movie and also can add to favorites. You can also find information on showtimes, CDs, DVDs, online rental, online free watching.